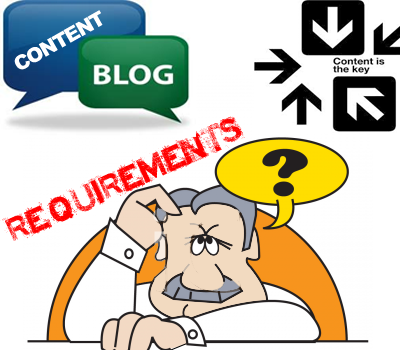 How To Determine Needs of Your Blog's Content? Knowing your audience’s expectations is a good way to evaluate your content needs. You can also decide between short posts and long posts, based on your audience’s expectations. Spend some time analyzing your blog’s audience to find out what kind of content and what frequency of posts they expect. Business Blog: For example, if you have a business blog, your audience expects knowledgeable articles from you. They will see you as an SME and expect something worthwhile every day. Your audience will expect at least one or two posts a day. This will ensure greater brand loyalty, and more traffic to your product pages. Personal Blog: If you own a personal blog, your audience will expect quality long posts that’ll motivate and thrill them. You don’t have to upload more than one or two posts a week, unless there’s demand. Just make sure that the one or two posts satisfy your audience at a deeper level. If it’s a personal blog, the content frequency depends on your desire to connect with your audience. It also depends on your eventual monetization plans, if any. Twice a week is good enough for a personal blog. With revenue as your main goal, you need to post regularly to keep the traffic numbers steady. At the same time, don’t overdo it. Even the most dedicated reader cannot be bothered to visit your blog 5 times a day to check the latest content. Keep it to 3 posts a day, and increase the frequency based on increased traffic numbers. Figure out how much content you’ll need to ensure 3 to 5 posts a day on average. Figure out how much content you need to factor in to ensure that many posts a day. Follow the 3 posts a day with a promotional post. Note that if your posting frequency is low, you must space out the promotional posts accordingly. You’re looking at slow but steady growth. Set the audience’s expectations with regard to frequency, based on how much time you have to blog. You may have a day job and not be able to devote time to your blog. A moderate frequency of 1 or 2 posts a week is good enough for steady growth. The best way to know how much content your site needs is to experiment with various frequencies. Don’t try to reduce your upload frequency drastically, as it will tell on your business. See if you can gain more mileage by increasing post frequency and playing with the length and format of your posts. Keep an eye on the numbers; is your improved content frequency working better numbers for your site? Check with your audience; are they able to keep up with the updated frequency? Do you find that all your posts enjoy the same readership or are some posts getting lost? Also experiment with the right time of the day and week to upload posts. This has been the most prominent technique when it comes to attract potential search engines. But it not only attracts them but also gave a huge boost to your traffic. Creating quality based content is the most important for a blogger, who want to take blog to next level. And as we all know according to Google engineer Matt Cutts, Content is king. After going through this post, I am sure you will come across this conclusion that to create ideal content we need pure dedication. In one word we can say, it’s the quality which makes our content admirable, so it’s crucial to promote excellence. If you have any queries then feel free to ask, Till the Peace, blessings and Happy Learning. This article is contributed by GO-Gulf.com, a website design and search engine optimization Company from Dubai that offers professional web designing and SEO services to online businesses in Middle East. Thanks for Liking, But Brother you are Copying our posts to your blog. Without Giving any Credits having good either you remove them or Attach a Link to original Source. Peace and Blessing Pal. Yeah Pal, Thanks Now They Are fine, Peace and Blessings. Sure!! Brother Take Your Time. And you Have Designing a Good looking logo Cheers Pal.